Weather, weather, weather. Almost three months was the situation awful. I was nervous and I felt discontinuation symptoms. All changed at the end of the year. Sky was clear and I had good conditions for astronomy. 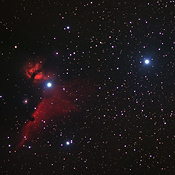 I decided to improve quality of picture with Barnad's loop (Sh2-276) and nebula Sh2-264 in constellation of Orion. But in the end I captured only part because (yes – you guessed) of the weather. 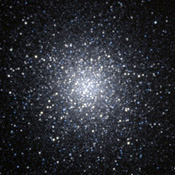 End of the last year was not good astronomy in this locality. 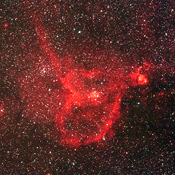 This is picture with faint nebula Sh2-264. During my lunch break there were nice iridiscent clouds in the sky. The colours of the clouds persuaded me to take a few pictures. So I decided to finish my lunch earlier, took my camera and made this picture. 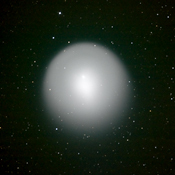 In this month you can see next exbibition of amateur astronomical photographs. It is installed at library in town of Zilina. These two nebulas are known as double nebula. 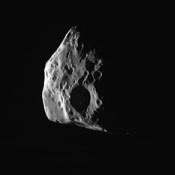 The shape of heard gave a name to larger one. The other is called Soul. I have tested next lens - short 200mm teleobjective. 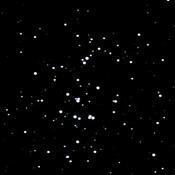 There are two faint nebulas between constellation Cassiopeiae and Persei. They called Soul and Heart. Here is the first of them. 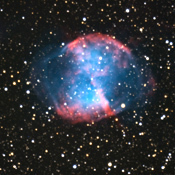 Almost accurately after three years I tried again to take picture of this great planetary nebula. The result is amazing. 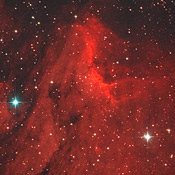 The Pelican nebula is next to North America Nebula. It is smaller. Both nebulas are beautiful. 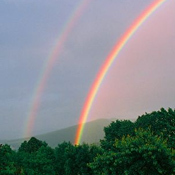 This is an image of first one. At first I have to say the weather was perfect. No clouds in the sky in front of sun during eclipse. 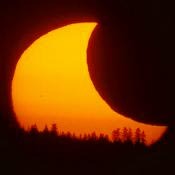 On the other hand I could observe just partial eclipse because of my location. Some night photos from my short two-days trip in High Tatras mountains. 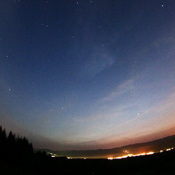 Yesterday evening I caught these very faint noctilucent coulds. To tell the truth - only one could. There were perfect clouds in the sky and sun halo. 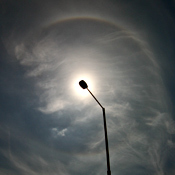 When I was going home for the lunch I looked at the sun and saw nice halo. This is probably the best known nebula. It is very beautiful object. Test picture of NGC 7000 - no filter, UHC-S filter(Baader) and H alfa pass filter (Baader). This is result. I saw this sun halo at my visit of observatory Vartovka. There are two RSS feeds in this web portal. So you can read news in your RSS favorite reader. You could find both links on left side under news box. When I was taking picture of M44, I have catched movement of asteroid 739 Mandeville too. This is video. My second try. I tried new objective and the difference is big. My equipment has a new member - 300mm Canon lenses. 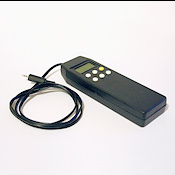 It is an older model - without image stabilizer. 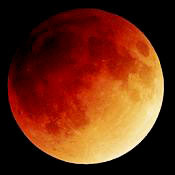 Meteorological models predicted clouds after beginning of this total Moon eclipse. Unfortunately they were true. 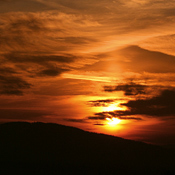 There was a sunset with little sun pillar. 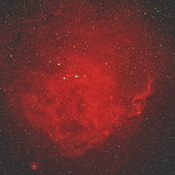 I want to capture emission nebulas. 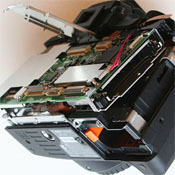 All digital cameras have IR-cut filter in front of the CCD chip. But problem is in this filter. 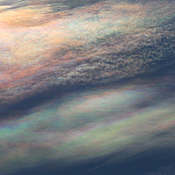 It is not suitable for capturing emission nebulas beacuse it cuts wanted light wave length. The solution is to exchange it. 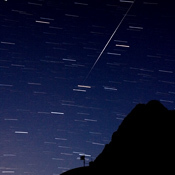 An external shutter is necessary for taking pictures with exposure time over 30s (bulb). 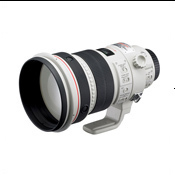 Electronical programmable shutter is very useful accessory for astronomical photography. 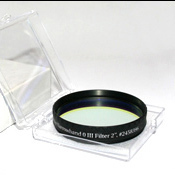 There is a new filter in my equipment - filter for light pollution reduction. 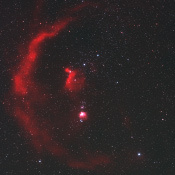 Constellation Orion is full of wonderful objects. 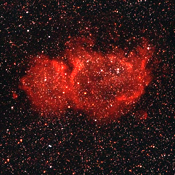 Here is a picture of nebula IC 434. Great comet Holmes is still increasing. It is really big.